Welcome, Friends! 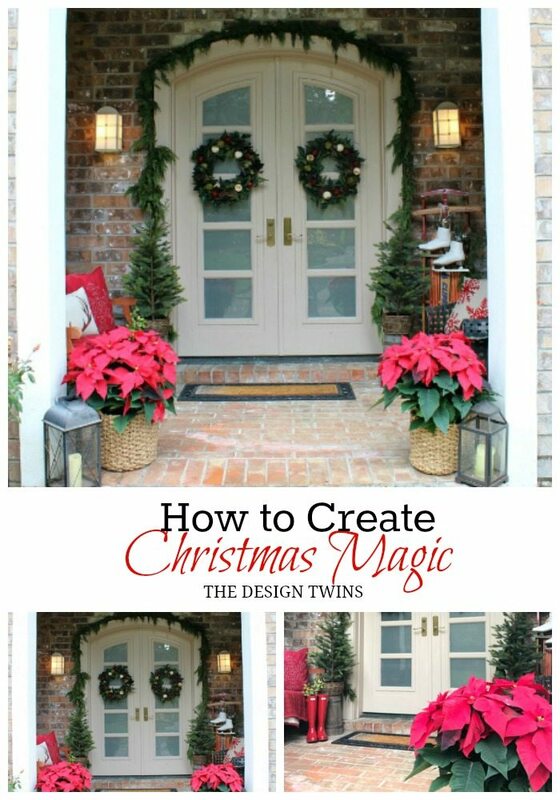 I can’t wait to take you on my Christmas Magic Home Tour! I’ve decked the halls embracing some brand new elements as well as some tried and true traditions. As ever, I love to mix things up, and the holidays are no exception. 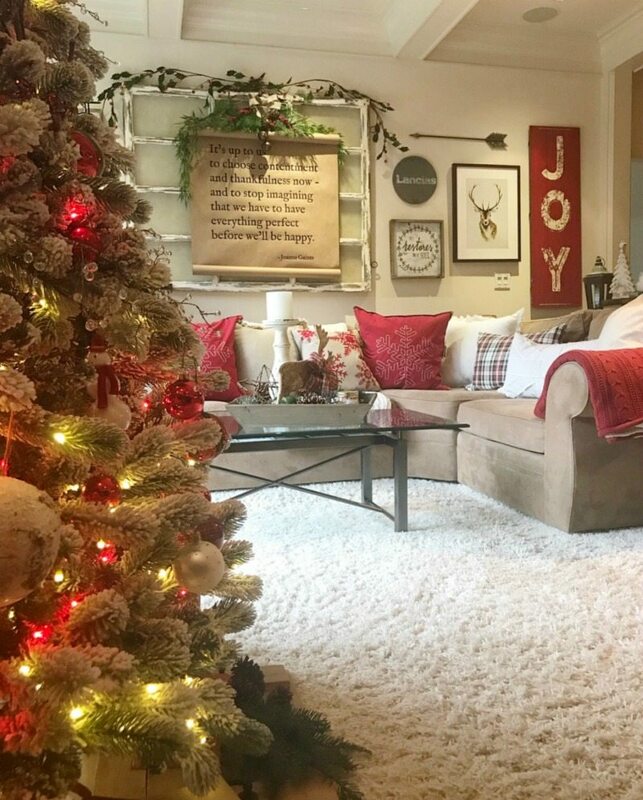 While I share my easy decorating tips I will also give you my best advice to not just survive this season but thrive! If you have arrived from our amazing friend Sheila Maison de Cinq a very special welcome! Isn’t Sheila’s style elegant? 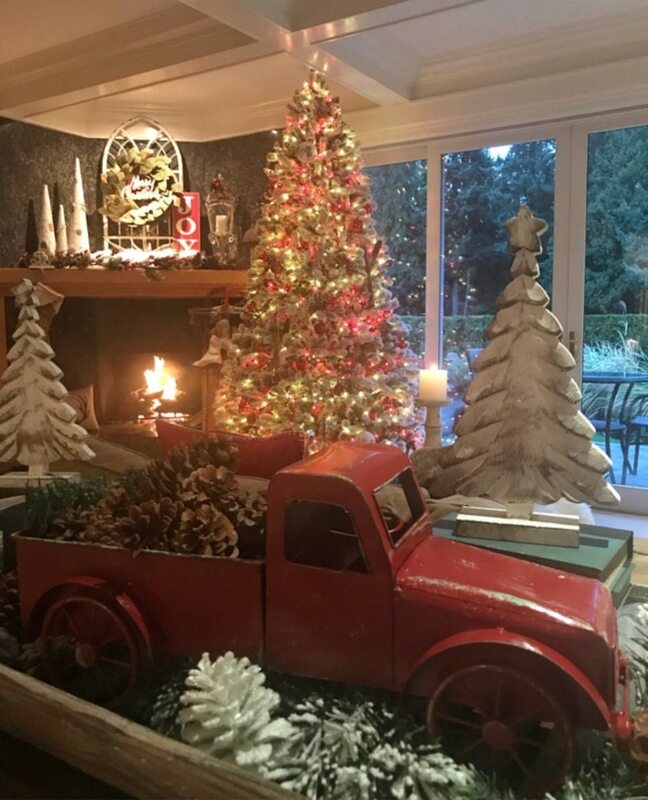 Before we get started don’t forget to check out the holiday decor we created last year: Jodie’s Christmas Home 2016 and Julie’s Christmas Home 2016. We have included some shopping links for your convenience. These are affiliate links and help us support our blog. 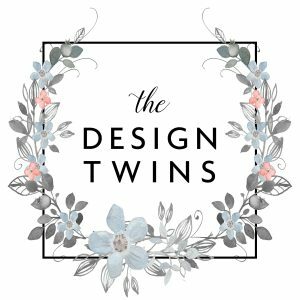 We truly appreciate it when you shop with us so we can continue to bring you The Design Twins. Holidays are all about family and tradition, time-tested traditions and brand new ones you decide to create. Why are traditions so important? They knit a family together and provide constants in a world of change, reliability in a world of unknowns. They tell our children this is who we are, this is what is important. Traditions bridge generations, link us to our past, and pave a solid road toward the future. Traditions are a family’s love language spoken over time…what are yours? What will your family’s story be? They are told through the traditions you create, and the traditions you uphold. 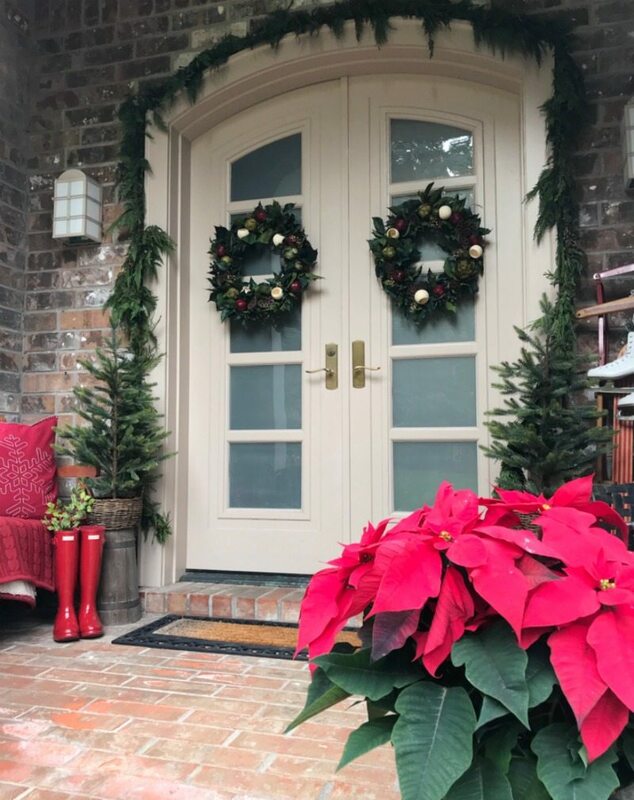 Keeping with tradition I kept my front entry festive with classic green and red. Large poinsettias greet visitors. 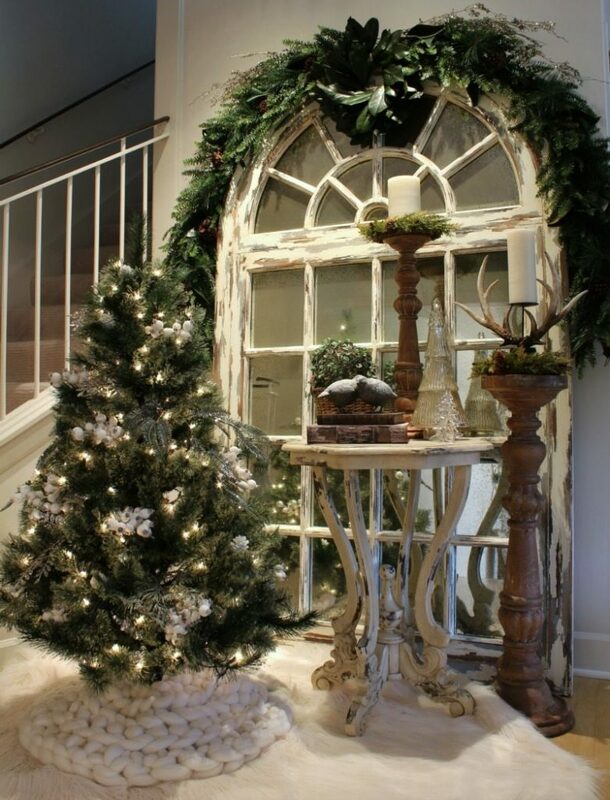 A simple evergreen bough frames the double doors. Two unadorned Christmas trees in baskets flank the entrance. The bench is covered with bright red comfy pillows and a thick woven blanket inviting friends to grab a cup of cocoa and sit awhile on the covered porch. Red boots and a traditional sled adorned with evergreen and vintage skates finish the look. I hope my front porch says “Welcome!” Now, it’s time to come inside! Welcome, Friends, to my home! My goal for my entrance was to make a statement with refined elegance. For my color scheme I chose green & gold (against the black chest). Once I decided on the mood and the colors I collected what I owned and began to build. I removed the two side-by-side mirrors that hung here for years and replaced them with this holiday scroll. The scroll itself made a huge statement on its own, but I still needed to frame it. 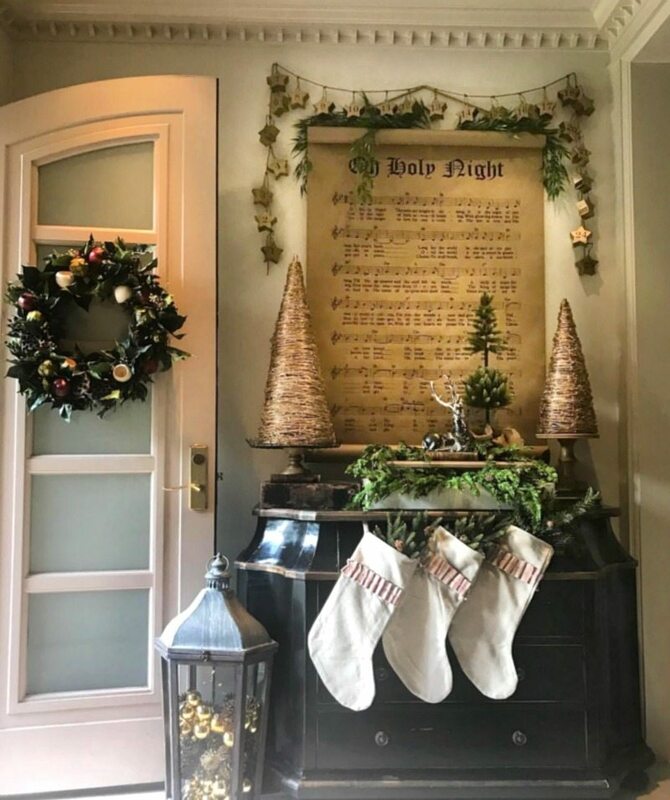 I chose this playful yet elegant antique brass advent garland and some greenery. I like how the two gold conic trees frame and balance, but their slightly different sizes don’t make it too perfect. Decor Tip: When decor is too balanced and matching it can feel expected and boring. The goal is to create balance without perfection. 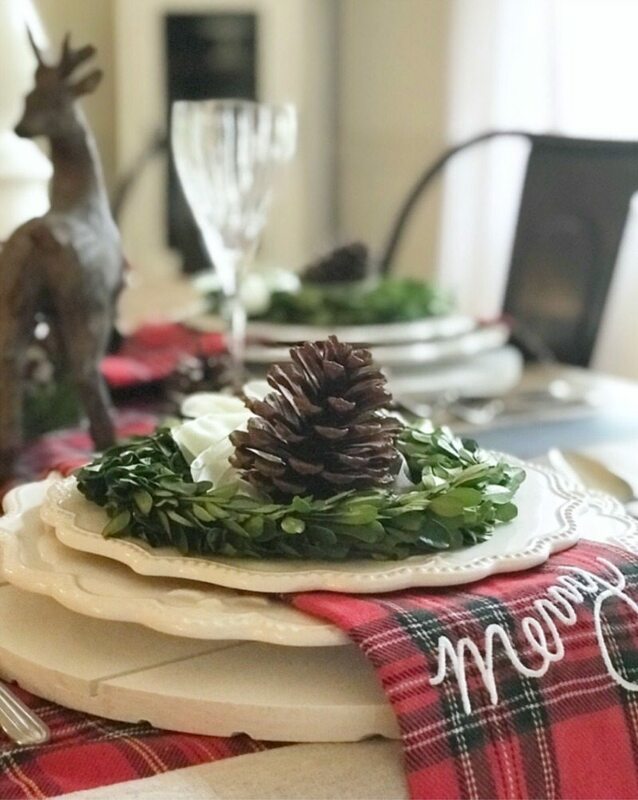 I used all faux greenery here to create a look that would last through the holidays. I used old vintage-inspired books and a wooden stand to add interest and create varying heights for the display. 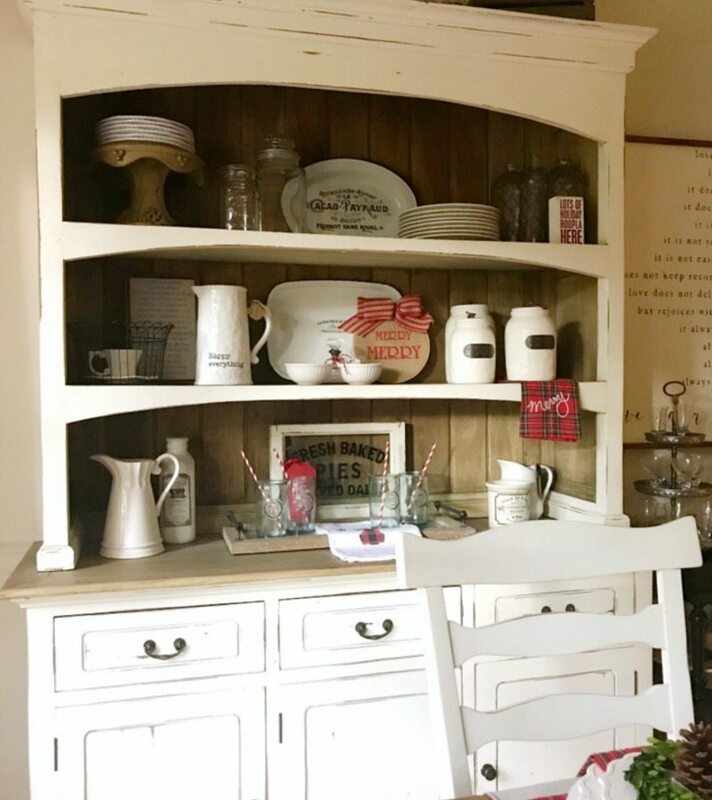 Before I began decorating this space I knew 3 things: 1- I wanted it to be a great farmhouse statement, 2- I wanted it to be a continuation of neutrals with only pops of green as my color, and finally 3- I wanted to incorporate the book theme. I’m pretty excited about the way it turned out. As the decor emerged I was surprised that an additional theme emerged….deer! I’m in love with deer, antlers etc. and even more so during the holidays. They look like they belong among the evergreens. 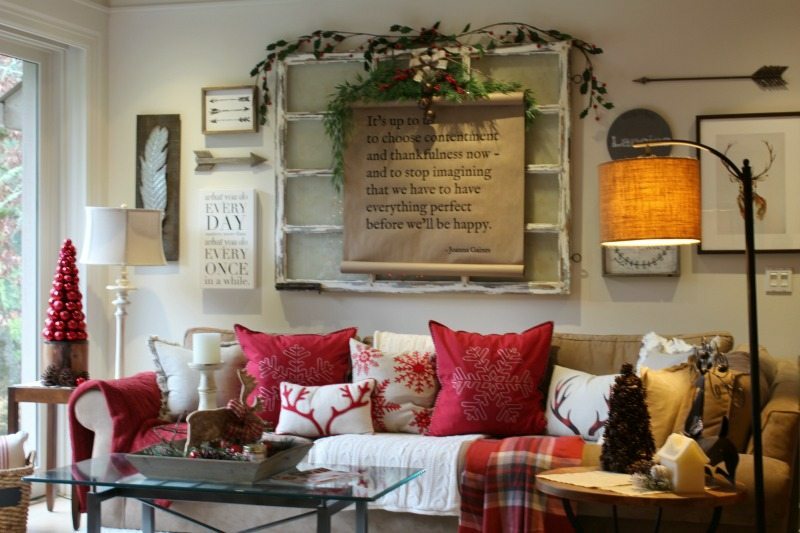 Plus, they say “farmhouse Christmas”, don’t you agree? I love to have fun with my decor and try new things. 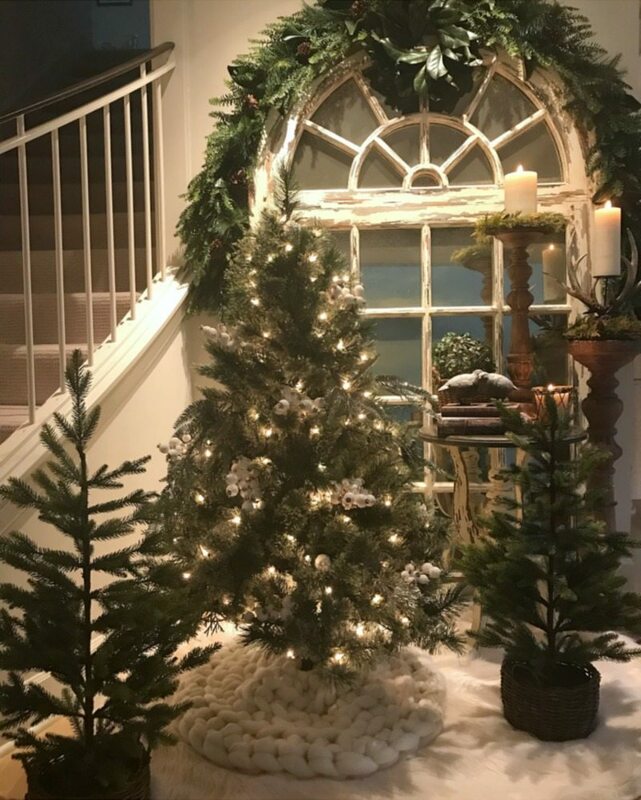 This Nordic-inspired tree was the perfect opportunity to give my hallway a fresh feel this year. I love the simplicity of the birch log tree and decorating with natural elements. 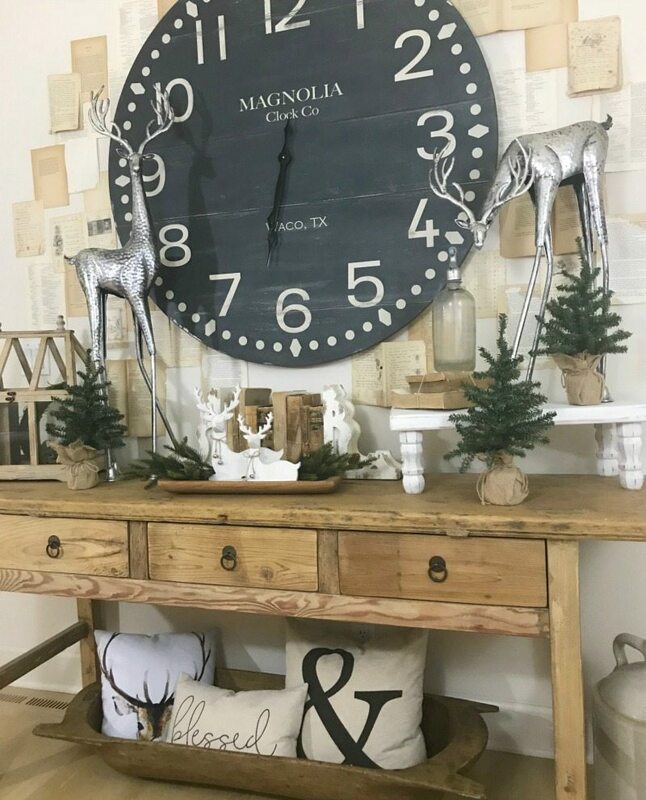 It blends beautifully with the rustic mood of farmhouse decor but adds its own unique twist. When I was in England recently I found the perfect decorations to use with the tree. After donning 4 sets of mini battery-operated light sets I added white ceramic stars and one fabulous pom-pom banner and voila! It took longer to create the right decor to frame it. 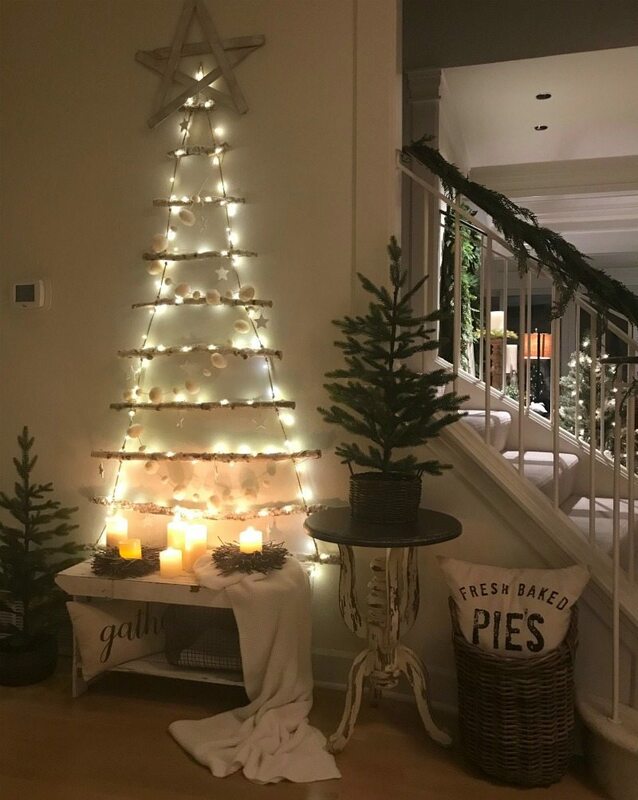 I wanted to keep things rustic and neutral, beginning with my chippy white farmhouse bench, a white throw, a slew of candles set in a couple of twig bird nests. I added a rustic basket, a couple farmhouse neutral pillows, a distressed side table and two small faux trees. 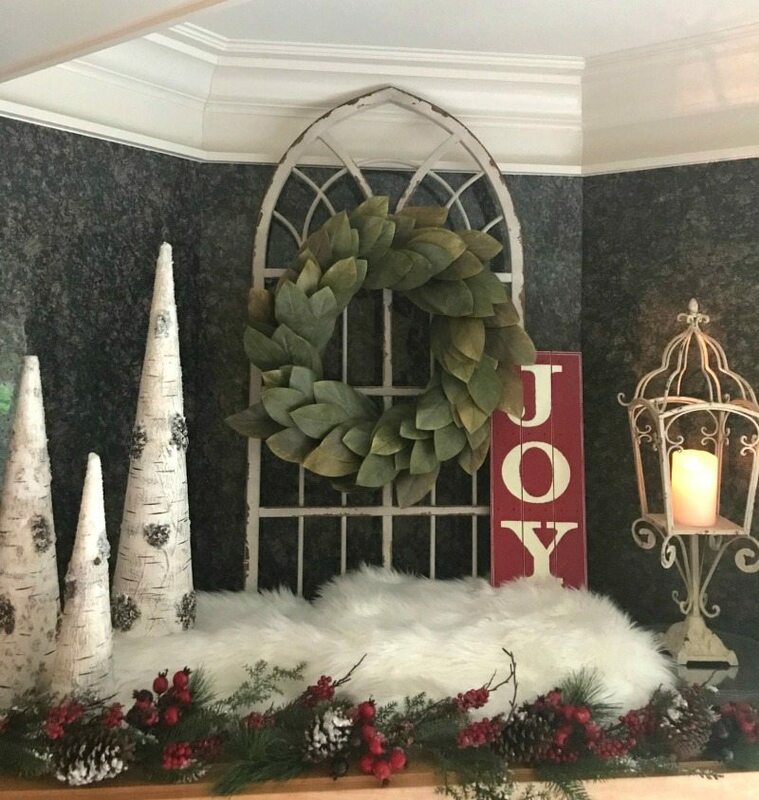 I had so much fun creating this wintertime vignette. Last year my 9 ft. tree stood here, and while I loved it, I wanted to do something different. I purchased a slew of mini trees to create a small winter forest feel (all shopable below). I created the look of snow by using a faux fur blanket like a rug and a chunky wool knit tree skirt. Purchase the tree skirt from Becozi using our coupon code TWINS10 to save 10% off your entire order. I framed the large arched leaning window-pane mirror with 2 faux evergreen garlands, added a dried magnolia wreath in the center. The vignette is framed by several of my solid wood candle holders. 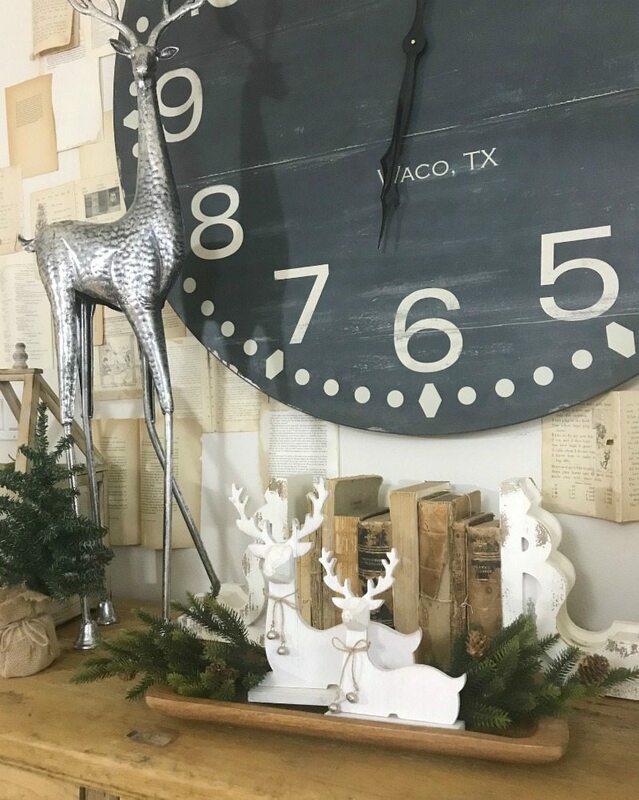 Details like white sparkling winter doves, antlers and candles add just the right amount of character without overdoing the scene. Shop the items available online below. My spaces are continually evolving…that’s just how I roll 🙂 I can’t stop playing and tweaking! A few days later the small trees were visiting another area. I added some sparkling branches to the top of the garland. I swapped the small table out for a slightly taller, more elegant table. Then the table-top vignette evolved as well. 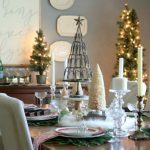 I removed a rustic candle and replaced it with shimmery silver Christmas trees that reflect beautifully in the mirror. The effect is double. The trees will probably come back but I think the rest of the changes will stay…but who knows haha! I try to never let any of my decor get too comfortable! Each look is a different mood. For a decorator who loves change this was an added bonus! Everyone in the family has a different favorite, so we have fun each having our turn to choose! I added 3 large garlands of sparkling crystals to add glitter and sparkle. I chose dozens and dozens of red bulbs to continue the red theme. Specialty tartan ornaments add detail. Underneath I used two tree skirts to achieve my desired affect. 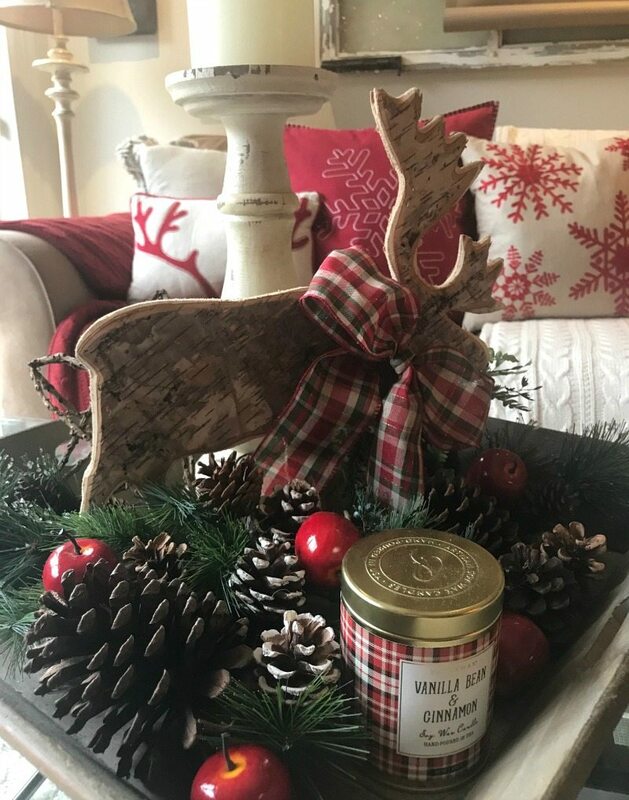 I created a vignette under the tree with a cute rustic-handled tray, some red books, a mini sled, pine cones, and faux greenery. I added a few faux presents to “finish” the look. 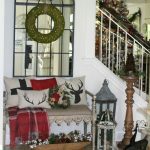 Last year I found a vintage sleigh that added charm to my front porch Christmas display. I knew I wanted to use it again for the porch. This year I wanted to bring that fun vintage Christmas charm inside. 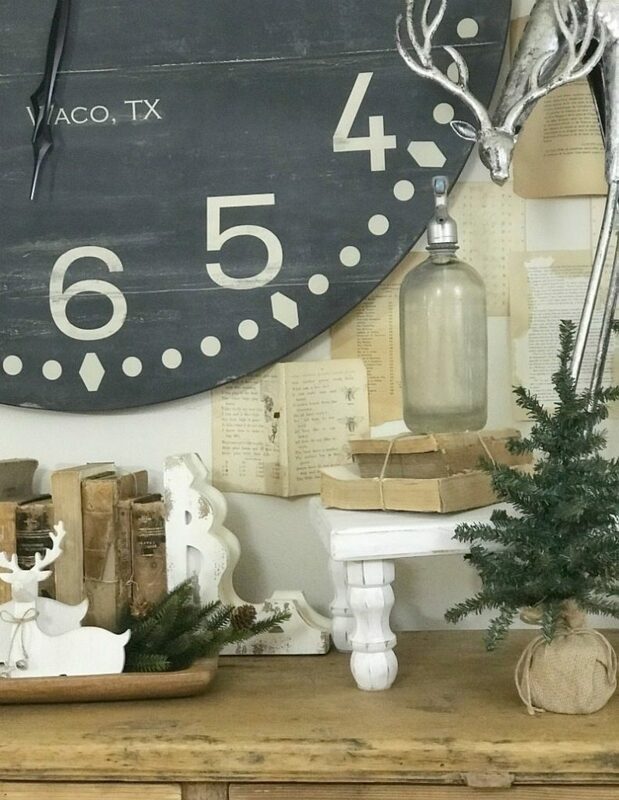 So when I recently went to a vintage market on my “must-find” list was another antique sled and hopefully a pair or two of vintage ice skates to decorate the sleds. 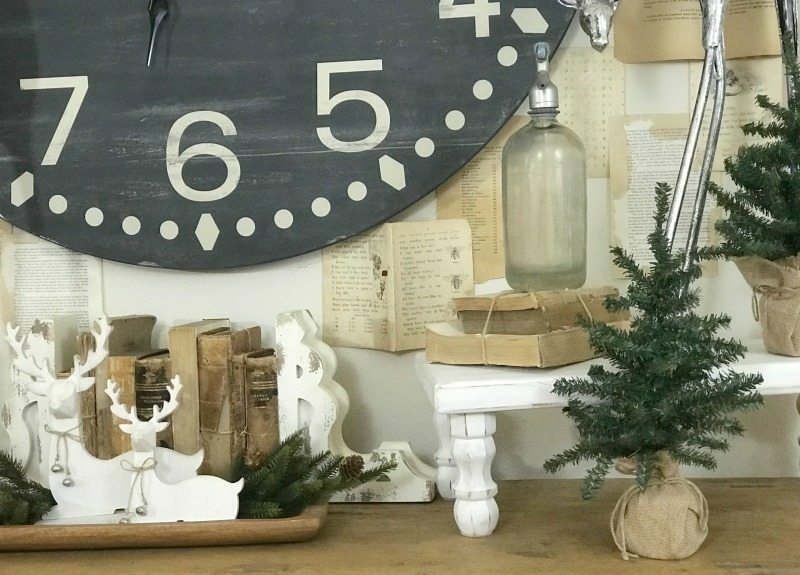 I just love the charm and character these pieces add to my holiday decor. I created a “snowy” backdrop with my faux white birch trees and a white faux fur throw. The mantel is framed with festive red berries & frosted pine cone garland. I used similar, but different sized joy signs on either side of the room. Both serve as “exclamation points” that balance the red and help define the room. 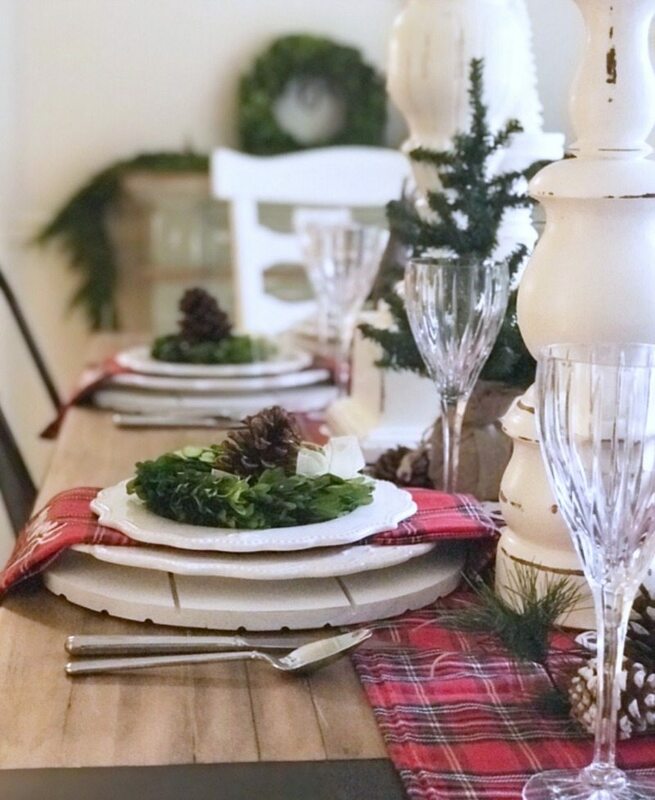 I took my dining room inspiration from the red tartan Merry Christmas runner and matching napkins I purchased last year (available to shop below). 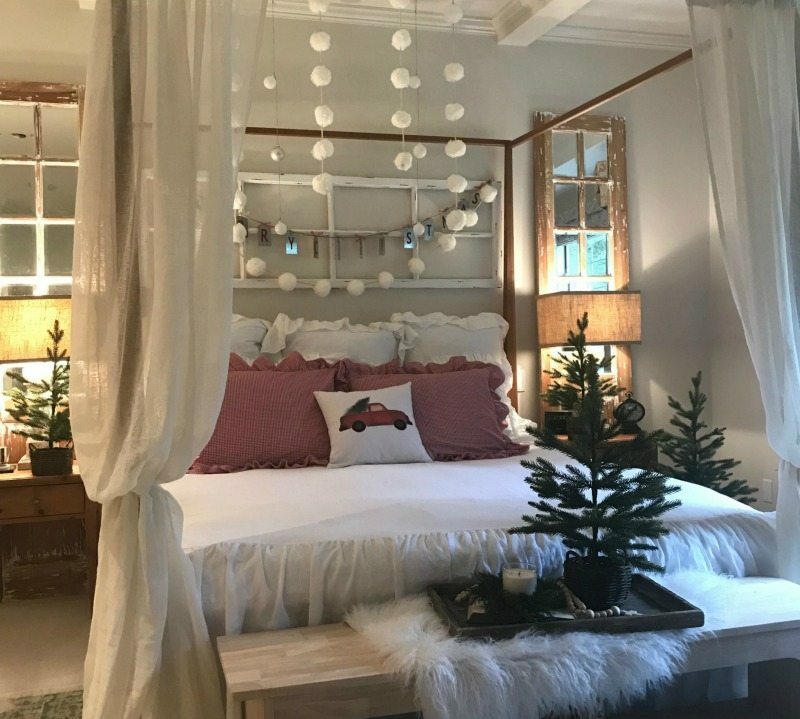 As I decorated this room for Christmas and began adding red it was the final straw in my battle to keep the blue decor that had originally defined this room. I have been decorating with color season after season, and it has clashed more often than not. So I took down the beautiful silk drapes and rolled up the rug. I’m still on the hunt for the replacement rug, but I hung white linen drapes. Moving forward it was a practical move on my part. I love the layering of the place settings. These awesome shiplap inspired chargers are from my friend Jackie Sawdust Angel @sawdustangel and I adore them! Of course they look great here, but the best part for this practical girl is the fact that you can bet they’re going to look good ALL YEAR LONG! 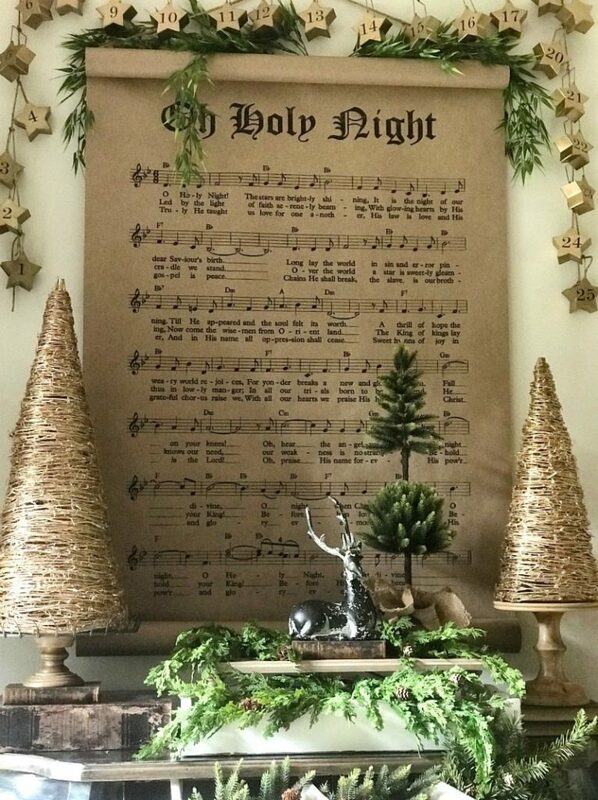 I topped the settings with mini boxwood wreaths and a simple pine cone. The look is Christmas festive, yet simple and nature-inspired. Lots of people ask me where I got my plates (that go with everything!). 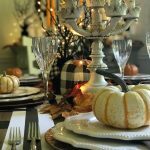 I have never found the exact ones, but I do have 2 similar sets, the exact table runner and matching napkins available to shop below. Can you say, “Too much fun? ?” haha! I really did have a ball decorating this room (no pun intended!) If you follow me on Instagram you know all about the shenanigans that went on in order to put this “snowball scene” together. I may have created a teeter-totter type of chair balancing situation to climb on over and over again to put up these hanging snowball garlands 🙂 I shared the antics on my stories and flat out scared many people. Oops! I didn’t mean to, but it was worth it, don’t you think? Also, the outpouring of motherly concern was amazing and even though part of me felt a bit like a scolded child, I mainly felt love! The white all-linen hand-made coverlet is the star of the show all year long. In this winter scene it feels like a blanket of snow. This is created by my amazingly talented friend Rhonda at Hallstromhome @hallstromhome . The beautiful chunky knit wool tree skirt is from another awesome friend Larissa at Becozi @becozi. 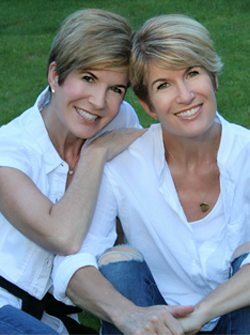 You can use our coupon code to save 10% across her site, TWINS10. The best mini Christmas trees EVER come in their own little baskets and were the most important element in creating Christmas Magic throughout my home, inside and out! I bought them in two sizes and basically plopped them down anywhere and everywhere for instant Christmas! 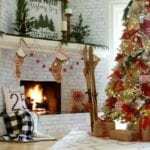 Christmas holds treasured memories for most of us, but the stress to do it all can sometimes sabotage our holiday spirits and ruin the beauty and happiness of the holidays. Try not to let outside pressures determine what’s important to you. Don’t try to keep up with the Jones. Stay focused on what makes sense for you and your family in this season of your lives. It’s not necessarily about the perfect decor but the right attitude. It’s important to keep everything in perspective in order to create truly magical memories for you and your family. 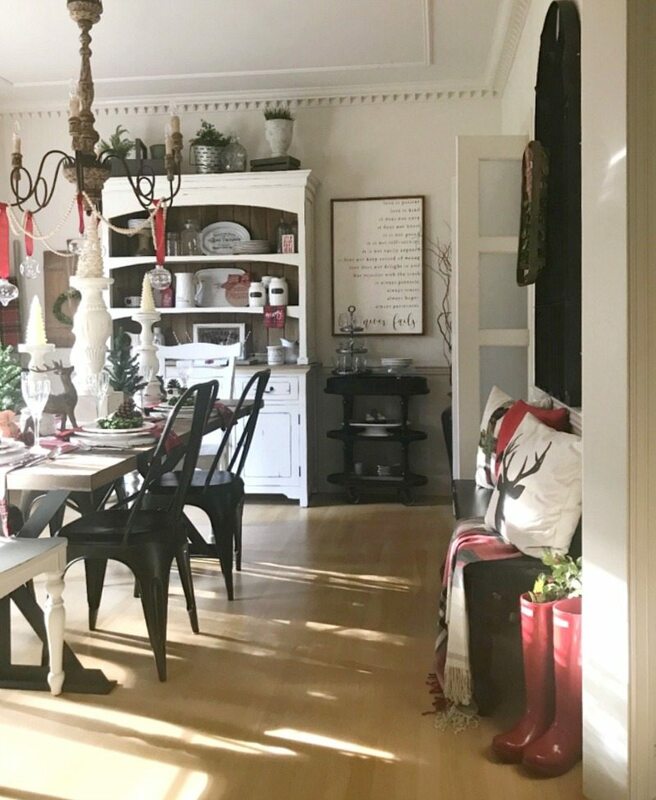 I hope you have enjoyed my Christmas Magic Home Tour as much as I have enjoyed creating it and presenting it to you! Jodie and I sincerely appreciate your kindness and support and would absolutely love to hear from you in our comments below. Quick, grab another beverage of choice, but don’t go anywhere! We have so much more incredible inspiration coming. 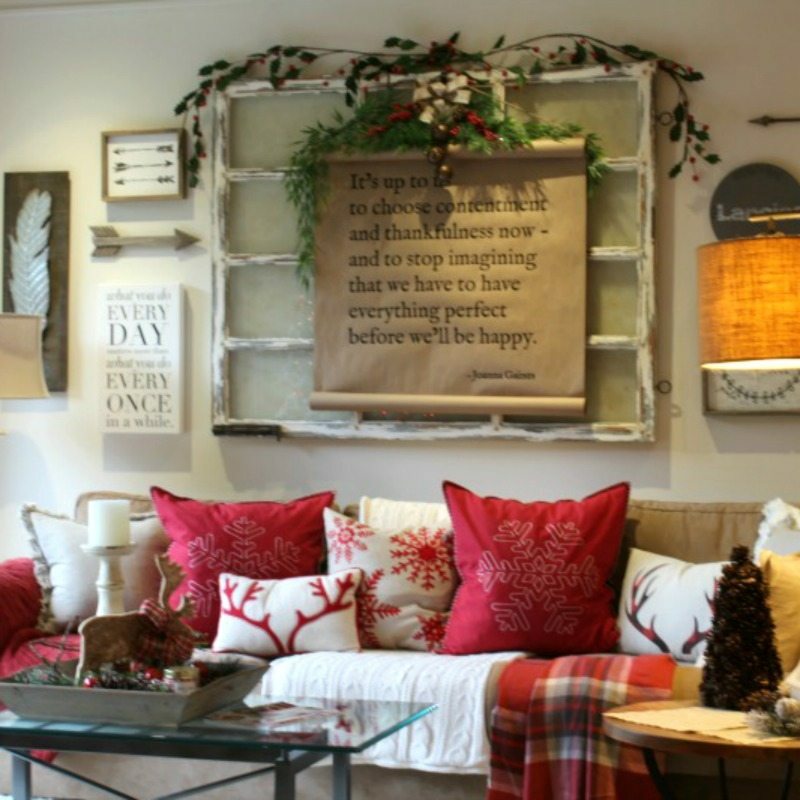 Please continue the Christmas Home Tour by visiting Kim & Lacey Styled with Lace . 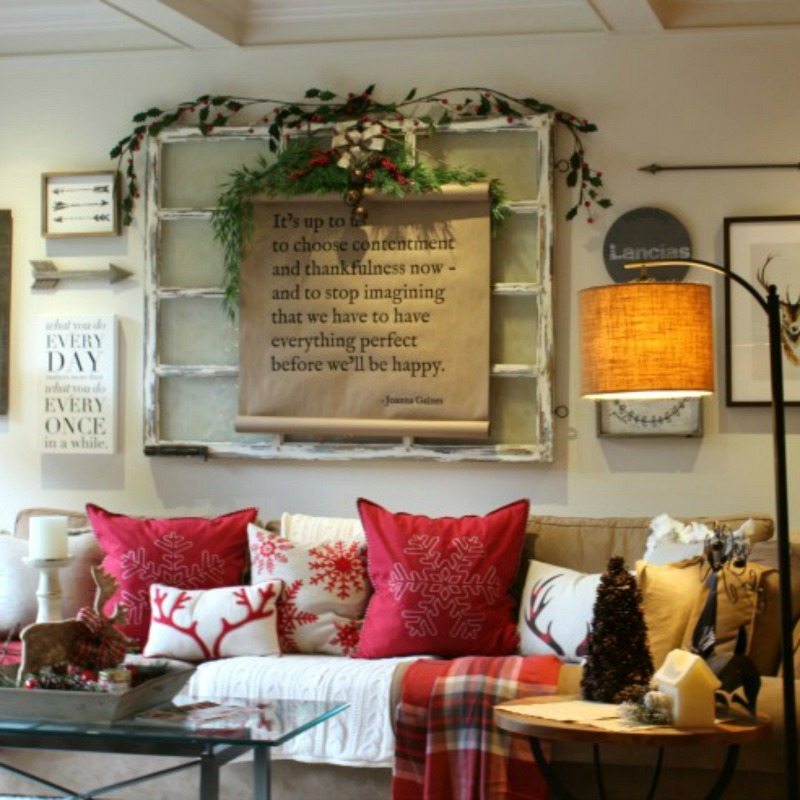 We are sure you will find tons of beautiful decor ideas! And be sure to visit all the blogs on our tour. Merry, Magical Christmas to All! P.S. 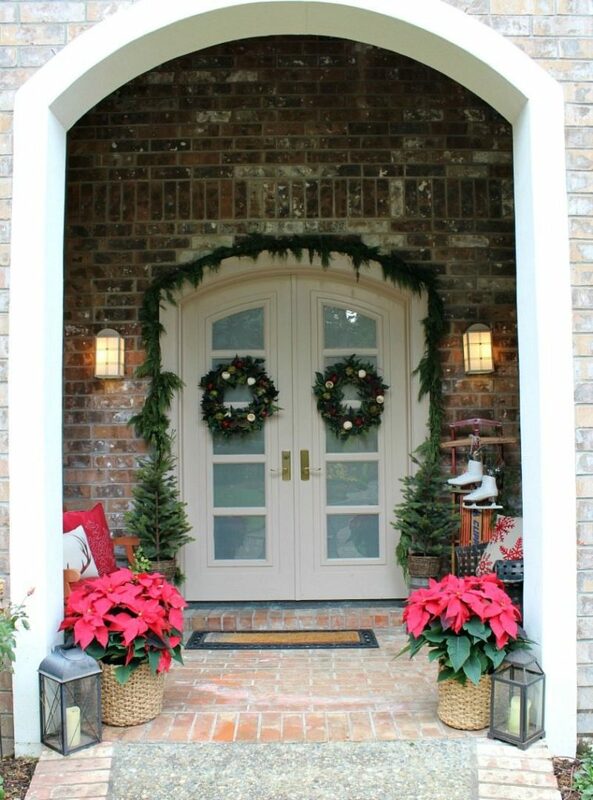 Stay tuned in just a few days to take Jodie’s Christmas Home Tour. She’s outdone herself so be sure not to miss it! Merry Christmas to you and Jodie and your families! ???? Such a beautiful Christmas tour! I love every detail. SO much Christmas magic. Julie you have outdone yourself here! Your home is so cozy and inviting- can I come over?! Seriously, this is what Christmas dreams are made of. What a special scene you have created for your lucky family! Su casa esta may bonita y hermoso! Come me encantaría mi casa a si. Your home is just beautiful. You didn’t skip a detail and the layers of style look so natural. You truly have a God given eye. Blessing to you and yours. Sit back and enjoy the beauty that is your home. Like seriously so gorgeous!! So much awesome inspo and tips!! 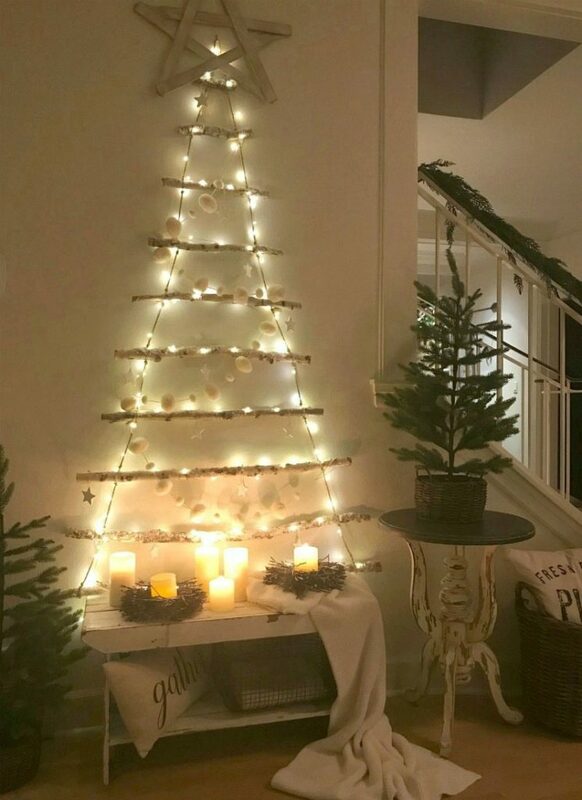 My favorite is the Nordic-inspired tree!! Julie you truly have created a magical space for your family and friends to enjoy the holiday in! 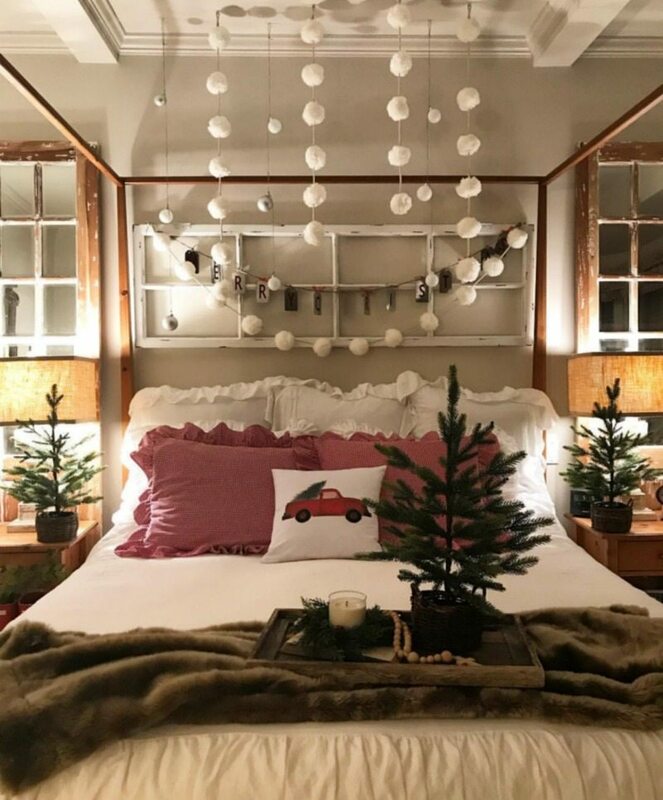 Love all the cozy lighting and the pretty little holiday touches everywhere! Unbelievable!!!! I don’t know how you do it …This is stunning! Gorgeous decor! 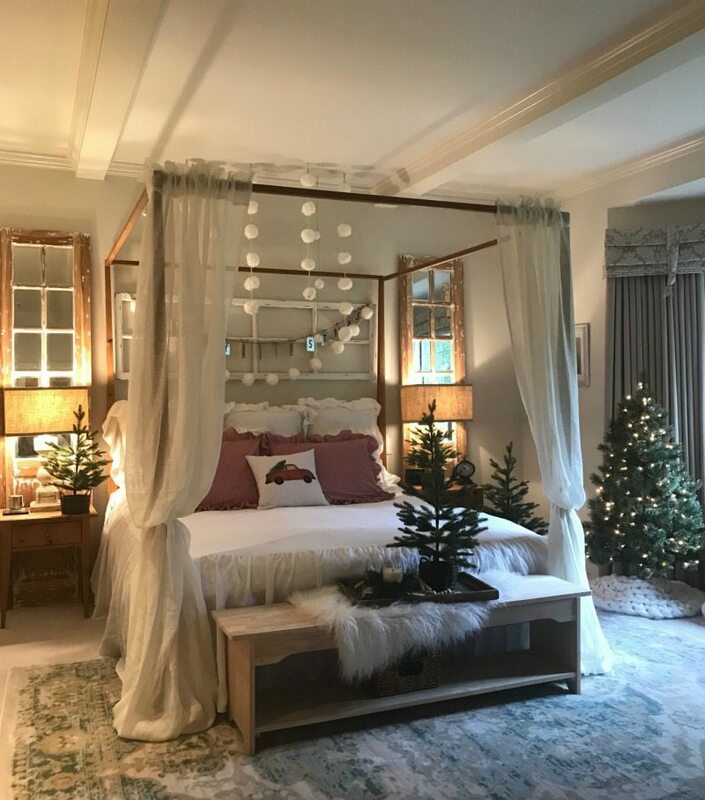 I must say I think my favorite are the snowballs hanging over the bed! Fantastic tour ladies! Everything is so cozy and festive, love it. Where did you find the scrolls? Wow, wow, wow!! Such a merry and bright home for sure! 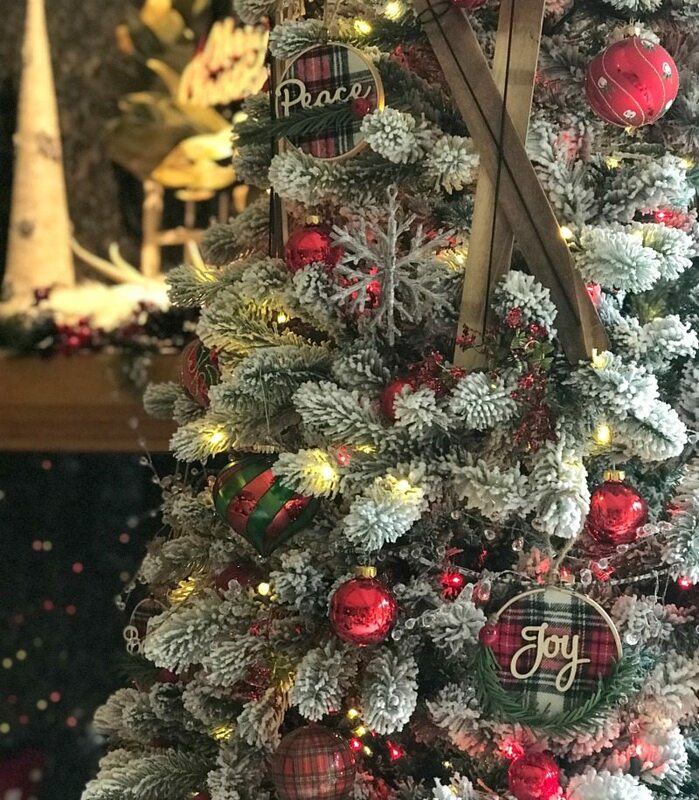 Everything looks so beautiful and festive, Julie! really loving the addition of the red lights to your tree! 🙂 So fun “hopping” with you! Loved seeing all your dramatic Christmas splendor. Now, I’m really in the mood for Christmas! God’s blessings be upon all our family. Each an every corner of your home is so magical. An amazing Christmas tour jam-packed with so many inspiring ideas. Oh my goodness Julie! This is just so fun! What a beautiful Christmas home you have made! Your entry is out of this world amazing… So gorgeous and festive! 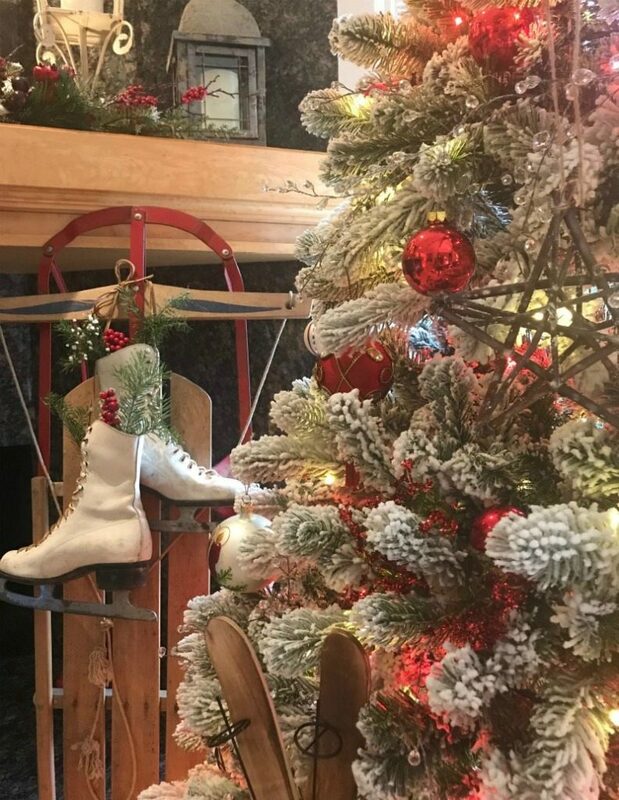 I love your beautiful tree and those cute ice skates! 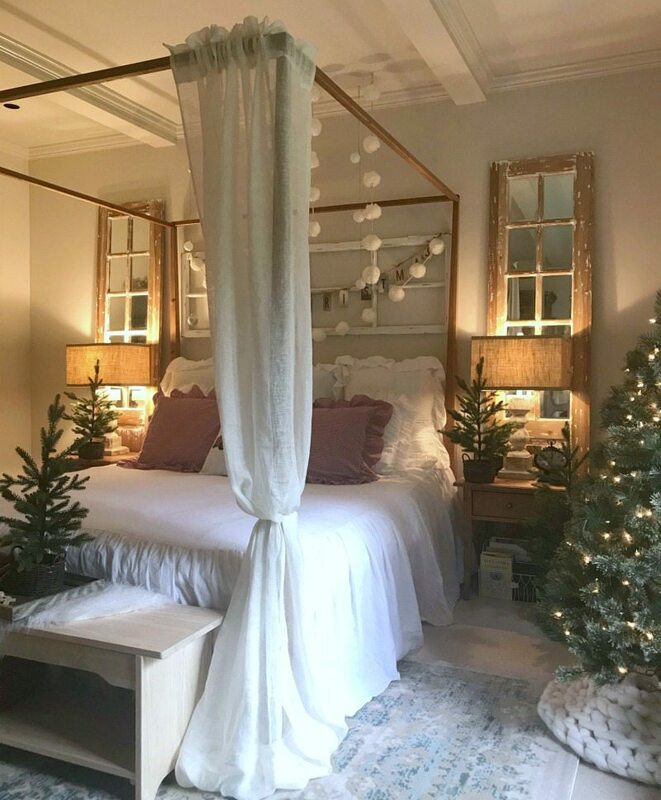 Your mantel is so beautiful and your bedroom is so serene and romantic for the holidays! Everything is perfect. A very merry Christmas to you, dear friend! And your porch is always stunning in any season! Happy Holidays to you!